With a $205 million investment, the Jefferson Washington Township Hospital Patient Pavilion & Parking Garage project is bringing world-class health care to residents of Washington Township. The $200-million Jefferson Washington Township Hospital Expansion Project is moving forward, with the new parking garage opening in Spring of 2019! We want to share important dates and changes to patient and visitor parking areas that will occur as a result of current construction plans. Necessary constuction will begin in main parking areas. This construction will temporarily affect parking in the front of the hospital. Free Valet Parking Service will be offered from 5:30 a.m. - 10 p.m. daily at the Main Entrance. It is strongly recommended that patients and visitors use the free Valet Service for their parking convenience. Patients/Visitors should notify Valet prior to leaving the hospital to help reduce wait times for your vehicle (contact info on valet ticket). A courtesy shuttle is available to assist patients and visitors who self-park by calling 856-582-3119. Please note: The main entrance will remain open throughout construction. Emergency Department access will not change. If you have questions or comments, please call 856-582-2500. Limited surface parking is available to patients and visitors at the Main Entrance, Emergency Department, and Lot E.
Please follow orange directional signage around the campus. Shuttle transportation will bring you to and from the hospital. Once parked, request a shuttle by calling 856-582-3119. Please inform the driver where you would like to be dropped off (Main Entrance or Emergency Department). 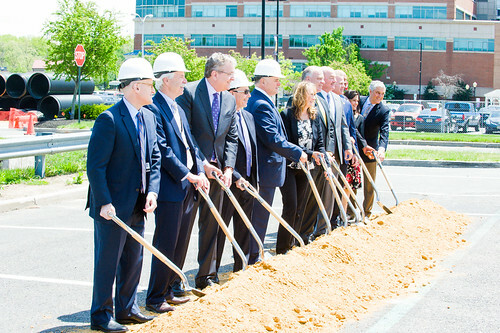 Joseph W. Devine, FACHE, President, New Jersey Division, and Executive Vice President of Hospital & Health Services at Jefferson Health; Dr. Stephen Klasko, President & CEO of Thomas Jefferson University and Jefferson Health; Jefferson Health - New Jersey board members; project architects; and elected officials break ground on the new Jefferson Washington Township Hospital expansion project. Click the video or link below to view the live-stream video of the Jefferson Washington Township Hospital expansion project.